We all carry stories around with us, stories we want - no, need - other people to hear. Because they can be made by one person, without expensive equipment or advanced skills, zines, comics and graphic novels have a long history of being a fertile venue for frank, revelatory storytelling. They have also been made and used by activists for decades. In this class, we will take a look at the history of nonfiction stories in comics, and create our short, nonfiction comic from scratch. Please come to class with ideas for a personal story - either a personal narrative you would like to capture in comics form, or a cause you would like to discuss in comics form. This class is open to folx aged 14 and up. There is a $75 fee for this eight session class, payable at the first session. Scholarships are available. Classes will take place every Sunday from 1pm-3pm, March 3 through April 28. Please email the instructor, Ellen Lindner, at ellenlindner@gmail.com, to sign up. Ellen Lindner is the author of two graphic novels, Undertow and The Black Feather Falls. She is also the editor of The Strumpet, a collection of comics by artists who identify as women. Her activist art is in the collection of the Smithsonian Museum, and she has contributed fictional and nonfictional short stories to many anthologies. Based in Upper Manhattan, she is currently working on The Cranklet's Chronicle, a collection of stories about women and baseball. You can check out her work at littlewhitebird.com or on Instagram @ellenlindna This class will be taught in English but all class materials will be available in English and Spanish. "Stories I Would Tell A Million Times: Creating Comics Rooted in Activism and Personal Experience" is made possible in part with public funds from Creative Learning, supported by the New York City Department of Cultural Affairs in partnership with the City Council and administered by LMCC. Instructora: Ellen Lindner Todos llevamos historias a nuestro alrededor: historias que queremos - ¡no, necesitamos! otras personas para escuchar. Debido a que pueden ser hechas por una sola persona, sin equipo costoso o habilidades avanzadas, los zines, historietas y novelas gráficas tienen una larga historia de ser un lugar fértil para contar historias francas y reveladoras. También han sido fabricadas y utilizadas por activistas durante décadas. En esta clase, echaremos un vistazo a la historia de las historias no ficticias en cómics, y crearemos nuestro cómic corto de no ficción desde cero. Por favor, vengan a clase con ideas para una historia personal - o una narrativa personal que te gustaría capturar en forma de comics, o una causa que te gustaría discutir en forma de comics. Esta clase está abierta a todo gente a partir de los 14 años. 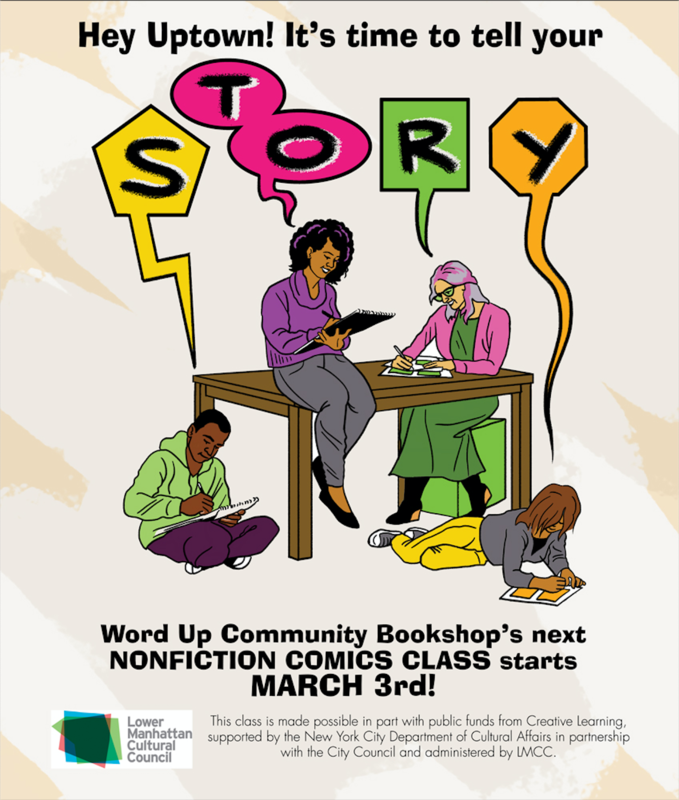 Hay una cuota de $75 por esta clase de ocho sesiones, pagadera en la primera sesión, que incluye una donación a Word Up Community Bookshop. Hay becas disponibles. Las clases se llevarán a cabo todos los domingos, de 1pm-3pm, 3 de Marzo a 28 de Abril. Por favor manda un email a la instructora, Ellen Linder, ellenlinder@gmail.com, para inscribirse.